Mussoorie is located in the Garhwal hills. Due to its immense natural beauty, Mussoorie is known as the queen of hill stations. In 1820 Captain Young from the British army was influenced by the beauty of this place and made this place his residence. This marked the foundation of a hill station called Mussoorie. The name, Mussoorie, is derived from plants of 'Mussoorie' which were found in abundance here. After its discovery, this hill station gradually developed as a center of education, business, tourism and beauty. Mussoorie is located at a height of 2,500 meters in the green Himalayan range. Due to its location and beauty Mussoorie is considered as the best hill station in the northern region. The modern bungalows, malls and well laid gardens which are located on the small hills around the area are enough to attract any tourist. As heat increases in the plains number of tourist inflow also increases proportionately. Mussoorie is very close to Delhi, its overnight journey and one can return in one day . So, some people come here to spend their week ends. Also, the major Hindu pilgrimages like Kedarnath, Badrinath, Gangotri, Yamunotri , Haridwar, Rishikesh are not far from this place. Tibetan Temple : This temple is located in Happy valley area of Mussoorie. Both Company gardens and Tibetan temple can be seen in one day. They are located one kilometer from Lal Bahadur Shastri National Administrative Academy. The Tibetan temple is evidence to rich Tibetan cultural heritage. This temple is sure to attract attention of tourists. Mussoorie Lake : This lake is located some seven kilometers on the highway to Dehradun. The gateway of this lake appears to be welcoming tourists from Dehradun. The entry charge to this lake is Rs. 15. One can enjoy boating at this lake. One also gets a very good view of the Dun Valley from this lake. The villages surrounding Mussoorie can also be seen from here. Lal Tibba : This place is highest point in Mussoorie. Lal Tibba is located in Landour area which is the oldest inhabited place in Mussoorie. Gunhill : Gunhill is second highest point in Mussoorie. From Gunhill Mussoorie appears to be changing colours every other minute. Each moment a different scene appears before your eyes. There are many shops on the hill top so one can have a small little picnic here. Kempty Falls : Kempty Falls are located 13 kms from Mussoorie. This place was developed as a tourist destination by John Mekinan after 1835. Municipal Gardens : The municipal or the Company gardens was previously (before independence) was also known as Botanical gardens of Mussoorie. These gardens were laid by famous geologist Dr. H. Fackner in the last century. In Mussoorie, one will feel shortened of accommodation options, except may be in the peak season and the variation include luxury, economic and budget hotels. 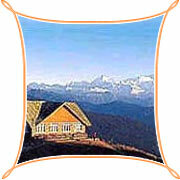 There are tourist lodges and cottage accommodation also available over here. Mussoorie is a hill station which has pleasant climate around the year. It is a very cool place with greenery at its full bloom during September to November. The best seasons to visit Mussoorie is between April to June and again during September to November. The nearest Airport to Mussoorie is 60 kms away from the place. The airport is called Jollygrant Airport but there are no regular flights to this place. As such Mussoorie does not have a direct rail link. Dehradun Railway station serves for Mussoorie too. This station is linked which Superfast trains to other major cities in country.